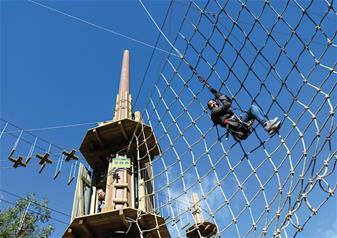 Feel the Tarzan or Jane inside you come alive on this thrilling outdoor adventure! Available until December 31 2019. Sessions run every: 30 mins. Please arrive at any time and you will be put onto the next available time slot. October: Open every day except Tuesdays. October Half Term (22-26): Open every day. **please arrive at any time and you will be put onto the next available time slot. After October Half Term: Open Thursday to Sunday from November to February (closed 10 to13 of January and the 17 & 18 of January). October: Open every day except Wednesdays. October Half-Term (22-26): Open every day. After October Half Term: Open Friday to Sunday in November and first 2 weeks in December. Last day 9 December. Have an adrenaline-fuelled adventure to remember at one of the four action-packed Go Ape locations in London. Choose from Alexandra Palace, Black Park, Battersea or Cockfosters and transform into the tree-climbing, vine-grabbing Tarzan or Jane for a day! Feel like you and your tribe are immersed in the jungle world as you sweep across the 50 metre zip wire, conquer the nerve-racking crossings and many blood-pumping challenges put before you! With instructors helping you along the way, you’ll be transported into the leafy world of canopies as you cross bridges and venture through the tree tops. Test your Tarzan skills on the high ropes, compete against your friends and find your inner jungle-strength as you work your way through the Go Ape course! This exhilarating outdoor experience is unmissable family fun for all. Alexandra Park and Battersea: 1 adult can supervise 4x 10-12yr olds up on the course and 1 adult can supervise 8x 13-15yr olds from the course or on the ground. Cockfosters and Black Park: Should include the ratio of 1 adult for 2 10-15yr olds. Adults must supervise from up on the course. 16 & 17 years olds can supervise themselves but not others.